This is the second most-popular post on the blog. That, I assume, is because it's about an amazing and enigmatic bit of animation. Some day I'll return to it and take a deeper look. For now, I'm reposting it at the top of the blog. Enjoy. 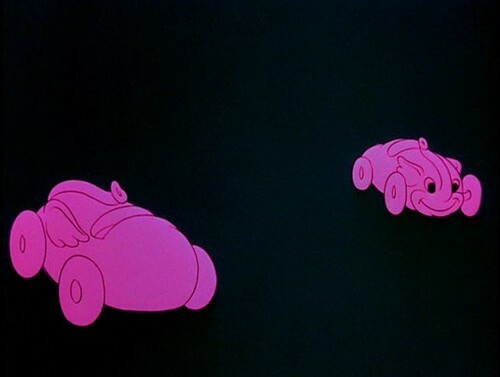 “Pink Elephants on Parade,” from Walt Disney’s Dumbo, is one of the best known, and strangest, animated sequences that Disney, or any studio, has ever done (see clip below). It’s strange on two counts. In the first place, it doesn’t seem to advance the Dumbo story in any way. 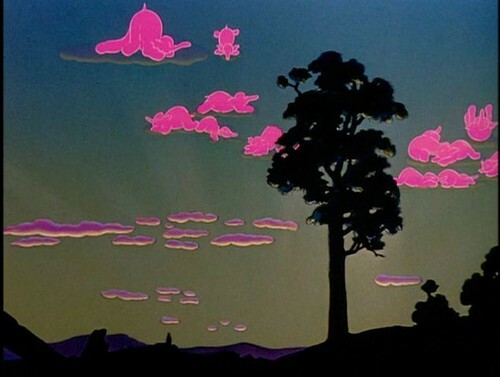 As the sequence begins Dumbo and Timothy Mouse are pleasantly drunk; when it ends they’re sleeping high in a tree. The sequence tells us nothing about how they got from one state to the other, nor does it tell us anything that’s otherwise going on in the movie. 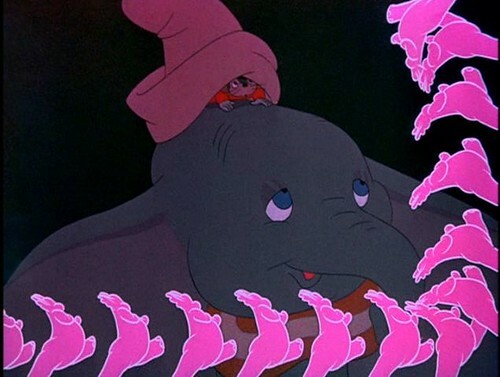 The movie is about elephants, the sequence is about elephants, pink ones; and that elephant connection seems to be all that links the sequence to the larger plot. Putting that aside, is there any order within the sequence itself or is it just a collection of strange gags? This is the question that interests me. And my answer is that, yes, there is some order there. There is a progression. and the merged bell expands, bursts, and becomes a portal for a parade of marching elephants. Each elephant in the parade is playing a musical instrument, which is a deformed part of its body. There are three things to note so far. 1) The parade of elephants has now become effectively detached from Dumbo. He blew the first bubble, but it became an elephant on its own. The rest followed from that. 2) The purely instrumental music we’re hearing is, in effect, being created by the elephants themselves. 3) At various points in this opening segment we see reactions from both Dumbo and Timothy; they’re on-screen characters. There is no structure in the film-space itself on which those elephants are marching. They’re walking on the border of the frame. This is the sort of self-conscious gag that’s as old as animation itself – such trickery was fundamental to Winsor McCay’s work, but also to Disney’s Alice shorts. Those elephants will parade around the entire perimeter of the frame and then they’ll start expanding until they burst. With that we move to new phase. We no longer see Dumbo or Timothy on screen; they’re out for the rest of the sequence. The elephants are no longer depicted as being the source of the music. They’re just elephants. And the music gets a vocal that comments on the rather creepy things happening on screen. And then we see a lone elephant looking rather scared in a strange institutional bed (it’s got castors at the bottom of the bed posts). Could this be a nut house, a funny farm? Perhaps. But also, that bedded elephant gives us a point of entry into the scene. Is that us? Could be. We zoom in on the yellow head, and its eyes become a pair of pyramids. What just happened? 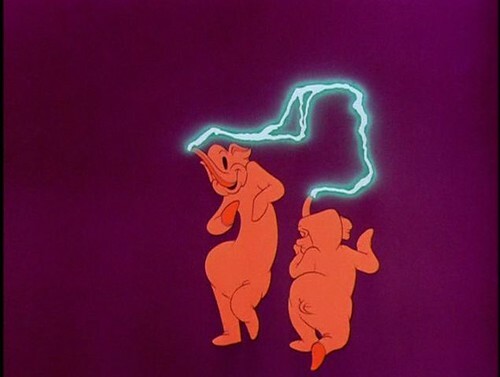 In the opening phase of this sequence Dumbo and Timothy are on-screen observing the parade of self-generated elephants. In the next phase an elephant in the psych ward is seeing strange things; and that elephant is us. 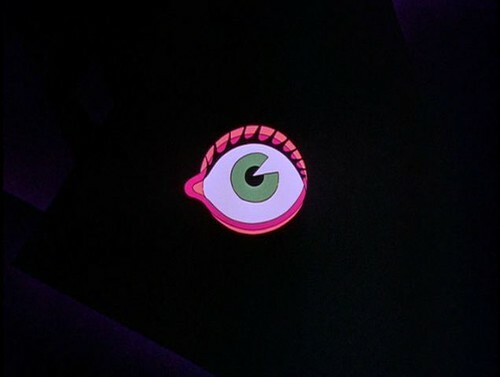 Now something up there on the screen is looking at us! And then they ice skate and ski. These are leisure activities. All of a sudden we’re in a very different world. It’s a social world; these elephants are interacting with one another. Those two elephants, the man and the woman, are having fun together. No more funny farm follies. Now, think of Dumbo. He’s been separated from his mother, with no sense that he’ll ever be reunited with her. His world must be rather scary. We could read the opening phases of this sequence, then, as depicting that mood. Those elephants shift shape and color. But the current phase, with leisure-time fun, that’s different — these elephants have stable shape and color, but their actions change. It’s almost as though that we’re looking ahead to what life will be like at the end of the film, when Dumbo’s had his triumph. But we’re not there yet. We’re still in pink-elephant land. We’re got two more phases to go. The skiing gives way to a Latin sequence (don’t ask me how, just watch the movie, clip below) with up-tempo Latin music. Hot hot hot! ... the elephants become cars, trains, planes, toboggans, all whizzing around through empty space at a faster and faster tempo. Whatever else Disney has achieved in this sequence, he’s gotten us from a state where we feel sorry for Dumbo’s really miserable plight to one where we’re relieved and perhaps even feeling a bit of hopeful expectation. We’re relieved that this strange pink elephant stuff is over. But the peppiness of that Latin music got the blood moving. Perhaps there IS something to look forward in this movie after all. It seems to me that that would entail real problems. It is one thing to show this cute big-eared baby elephant getting tipsy and blowing funny bubbles and seeing things, but do you really want to depict him bumbling around and somehow managing to fly without really knowing what he was doing? While there’s no technical difficulty in doing that, it does seem to me that keeping it realistic, even within the terms of the cartoon, would require that you besmirch Dumbo’s cuteness, or come dangerously close to doing so. Further, it would rob the “learning to fly” sequence of its interest. There wouldn’t be any dramatic point to it. Finally, it would reduce the difference between Dumbo’s circus world and the crow’s world to one of mere geography. We see Dumbo stumble around in the circus, he somehow begins flapping his ears, takes to the sky, and ends up in a tall tree – all before our watchful gaze. How dull, but disillusioning. 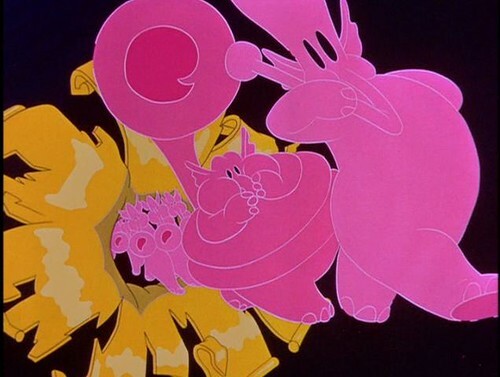 Instead, Disney takes us into this marvelous surrealistic sequence of transmogrifying pink elephants. What that does is eradicate the circus world from out minds. And that circus world was a pretty cynical one. It’s not simply that Dumbo and his mother were ostracized, but that the circus itself was not a place of fun and fantasy, but just a gig. Whatever it is that children have in mind when daydreaming about running off to join the circus, this is not the circus they dream about. The cynicism displayed by the animals in the opening day parade, for example, was marvelous, as was the nastiness of the clowns. So, the circus has been put behind us and we’re up a tree. With some crows. And, while these crows mocked Dumbo initially, they ended up sympathizing with him and helping him. As for those crows, they’re obviously modeled after black stereotypes, which is more than I want to get into here, though I say quite a bit about it in my post at Barrier’s. Here and now the point is simply that the world of the tree, and of the crows, is a different one from that of the circus. It’s in this world that Dumbo gets a new start in life. 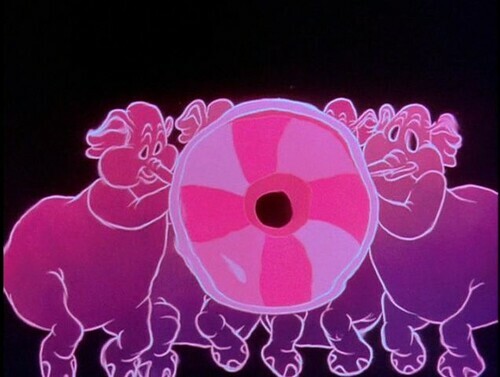 Might we then read the autogenesis of those parading pink elephants as the seeds of Dumbo’s own rebirth? Perhaps. Can’t say yet. Haven’t thought about it enough. 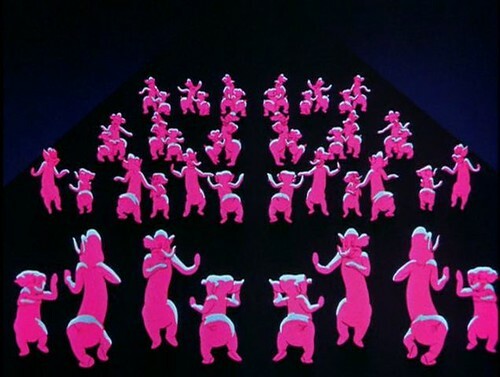 All I can say is that the “Pink Elephants” sequence does make some kind of sense. Give me another year and I’ll have made some progress figuring it out. Maybe. Some raw notes on this sequence from a couple of months ago. I love this post - on a number of occasions, you make a great point and I think "I wonder if he'll take it there next" and you do (and sometimes to somewhere else I wasn't expecting). I love the way you tie it into the structure of Dumbo's heroic journey so that it's not just a non sequitur but a fun-house reflection of the overall movie. 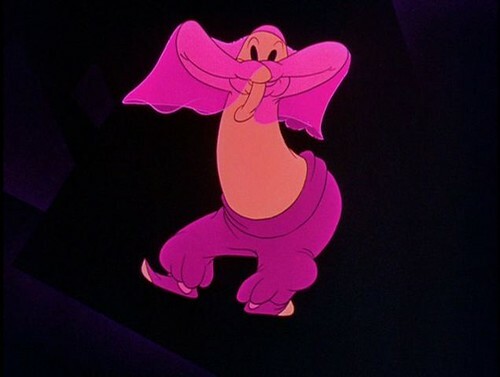 Glad you mentioned Barrier too, I am just now reading his Disney bio and your post made me wonder how closely the Pink Elephants sequence echoes the Silly Symphonie working model - i.e. music first, then animation (at least that's how it's working at the spot I am in the book, which is pretty early, just post-Mickey). Thanks for your comments. Glad you liked the piece. 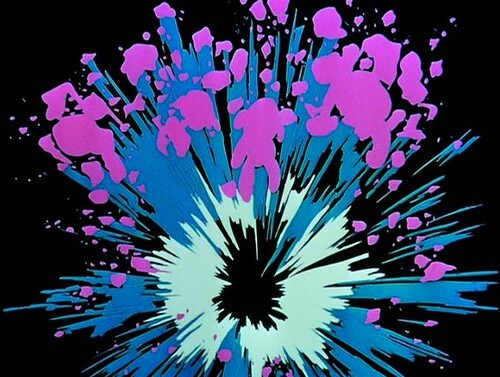 Once you start looking at a sequence like this frame by frame, LOTS of things pop out. There's more to say about this sequence, lots more. You might be interested in some of the other stuff I've written about Disney, both here and at The Valve. Most of it is about Fantasia, much of it more or less like this piece, but with fewer frame grabs. You can find links to The Valve stuff scattered here and there on this page. All the Disney stuff here is labeled "Disney," though Disney is only incidental to some of those pieces. Thanks, bill - I'll check them out. Fascinating. I love how you break down the sequence. It's that subtlety of storytelling that makes the early Disney features so fun to watch. Thanks, Eric. Those guys knew what they were doing. Fascinating! The sequence makes intuitive sense, but it's nice to imagine that there's some structure there, too. There's one thing I've been thinking about since I posted the analysis. That slinky oriental music, the belly-dancing elephant, and the eye that looks at you, all that’s roughly in the middle of the sequence. 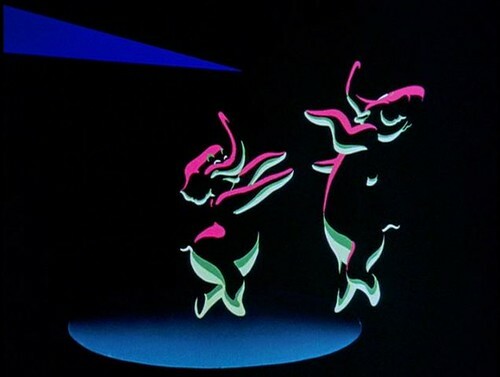 We find something very similar in the middle of the Nutcracker Suite from Fantasia. The “Arabian Dance” is roughly in the middle, the 4th of six segments. The music isn’t exactly slinky, but it’s certainly slow and sensuous. The moves of the fish were modeled on those of a belly-dancer brought into the studio. And at various points in this section, and nowhere else in the Nutcracker Suite, a fish looks directly at the audience. I don’t know what, if anything, to make of this. Mere coincidence? Perhaps. 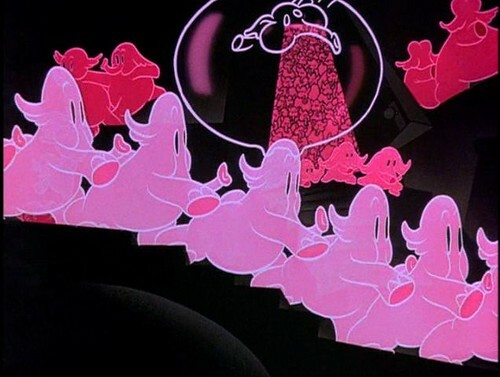 I doubt that there’s conscious imitation or parody, though one can certainly read Pink Elephants as a parody of elements in Fantasia. If I had to guess, I’d bet on similar (unconscious) solutions to a similar aesthetic problem. Finally, just to stretch it as far as it can go, after this point in Pink Elephants we see gender differentiated elephants. Well, in Nutcracker we’ve got asexual mushrooms before the sensuous fish and male & female flowers afterward. In the early version of Dumbo - the one published just after Disney bought the rights - Dumbo is taken to be examined by an Owl medical specialist. Part of the examination was psychological, and it rather looks as it the Disney writers played with the idea of making the Owl into a psychiatrist and making a feature of Dumbo's dreams. I've always wondered if, as the story got re-structured, the idea of a nightmare sequence was retained - remodelled to be the needed link between getting drunk and finding themselves up a tree. I like your parallel with Fantasia - but I think you're right in suggesting that in trying to string together a flow of surreal ideas, and in a hurry at that, references to images and themes from the film were bound to creep in. Ah, that's interesting, about the medical exam. You might be correct in suggesting that that's one of the seeds of this sequence. Bill, am I imagining it or do I detect a fleeting musical reference to The Sorcerer's Apprentice in the very firs moments, as the pink elephants proliferate? Could be, Barry. There is the slightly off-kilter motif that sounds like it might have come from Sorcerer's. Figuring things out never hurt anyone. I loved the way you pointed every little detail of the sequence!! Amazing job. Somehow every time I see this sequence my heart beat accelerates and I feel kind of scared. I was wondering, perhaps there is some kind of psychological explanation for this? it's not just the animation itself that is creepy, the soundtrack itself without even knowing what the movie is about scares people (I've asked a few friends to tell me what do they feel while listening to this and well, they recieved a bit of a shock and axiousness at the last part, not just because of the acelerated tempo but because they just felt that something was after them, they HAD TO run... yeah, I got a little bit shocked when I heard them saying that). I don't know, maybe I'm talking nonsense. Forgive my English, it's not my native language. Congratulations again, for your amazing post! I'm glad you liked the piece. And, yes, I DO think there's something about the music itself. There's lots of evidence that music entrains physiological systems so that you become synched up to the rhythms of the music. That might be what you're sensing. Take a look at some of my posts on synchrony and coupling. Well i dont really understand what all the fuzz is about..the bottle that falls into the water wat dumbo drinks is a bottle of absynte. Absynthe is illegal because of its halucinatic effect. Its also known being the muse of famous artist like hemmingway.they used to call it "the green fairy". One bad side effect of drugs or booze ypu hallucinate from is you sometime(lsd)think you can actually fly..in dumbo's case;he can! My point of view:drinks absynthe,got in a trip,trip goes really bad where he thinks he can fly and actually did.fits the story. This post is a few years old, yet I felt I should comment. 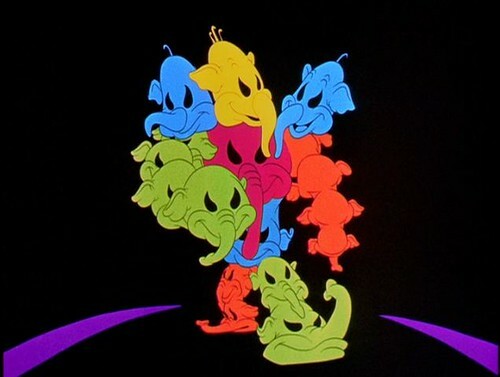 The "Pink Elephants" theme does not completely drop from each scene. What you hear in each scene is simply a variation of the original tune. Even in the Egyptian camel, snake, dance, eye sequence, the funky organ acting as a snake charmer's instrument is still playing the same, albeit heavily ornamented, version of the main theme. The fast waltz is just the theme in major, played with orchestra in 3/4 time. If you're a musician you're able to hear that musically, the scenes aren't all that disconnected from each other. wow! been looking for a meaning to this for years! "Let’s start at the beginning. Dumbo and Timothy have drunk water that was accidentally laced with booze." 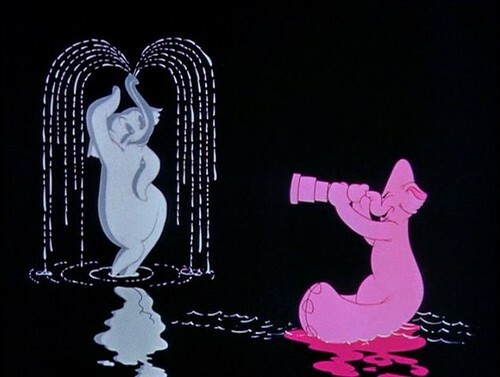 As I recall the movie, the boozing clowns laced Dumbo's (the object of circus' ridicule) drinking water with booze as a prank. The water was not laced accidentally. No, the bottle just got bumped and it fell into the water bucket. To me this segment is the "Lucy in the Sky" of 1940s animation. 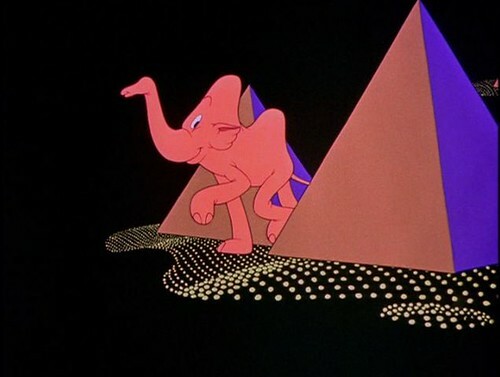 For me, watching the Pink Elephant On Parade sequence of the the film Just simply depicts being absolutely blind drunk. The the confusion of it all. I'm sure we all a some point, woke up after a good drinking session and asked your self what did I do? What happened last night? And this often leads yourself trying to figure out what had actually happed but everything is muddled up and confused. And wakeing up in some obscure place, happend to me a few time in my younger days. Fantastic post. Joe Rogan talks with Howard Bloom, Zoooommm! Is science spinning its wheels?